It’s the romantic’s favourite time of year – Valentine’s day, and it is fast approaching! It’s time to start thinking about what gift(s) to buy and how to spoil your Valentine this year. One of the best ways to show how much you love them is to give the gift of your time! Whisk your Valentine off for a romantic weekend away. There are many lovely destinations and getaways to visit in the UK but one our favourite places to go for a weekend break is Cornwall! 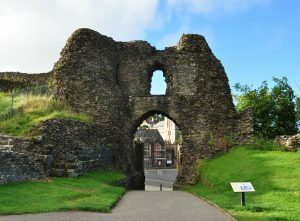 Set on a large natural mound, Launceston Castle dominates the surrounding landscape. Begun soon after the Norman Conquest, its focus is an unusual keep consisting of a 13th-century round tower built by Richard, Earl of Cornwall. Cornwall is famous for its delicious pasties, Cornish cream teas and Cornish ice-cream! No one leaves Cornwall without trying these delights! With so much to see and do in Cornwall it is the perfect place to visit for a romantic weekend of shopping and sightseeing. It is also the perfect way to escape and just relax especially with the beautiful beaches it has to offer! Top off your weekend with a romantic Cornwall hot air balloon flight.